PAX East has become the place to find a huge gathering of Independent smaller games thanks to areas like the Indie Mega Booth and PAX Rising. There are also tons of hidden gems scattered through the show floor that really standout from the crowd. I try to check out as many of the smaller titles as possible to see what is coming from these talented developers in the coming months. This is a really cool action game in the vein of Ninja Gaiden but with a cool morphing trick that cycles the game between 8 and 16 bit modes. The game follows the very traditional Ninja Gaiden action beats at first but then introduces some great tongue in cheek humor and supernatural elements involving Time Travel. The core gameplay has the Ninja travelling through the world originally in an 8-bit milieu but he quickly finds portals that allow him to switch to 16-bit mode which changes up the level and opens new paths to explore. The action is quick and brutal with a lot of quick reflexes needed to survive. The Messenger also features a skill tree for the hero that unlocks additional abilities to use as you progress through the adventure. What I really enjoyed about the game was the unexpected humor and effectiveness of mode switching to enhance the gameplay. It is a new take on a very established genre and was fast and fun to play. 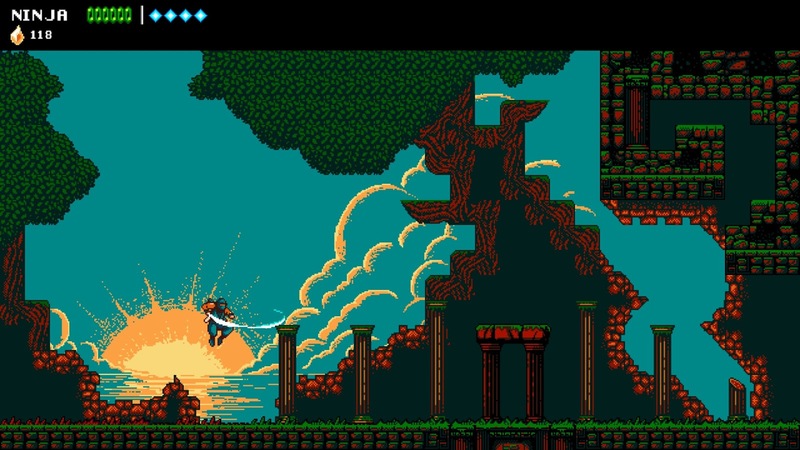 The Messenger will be available later this year on PC, Switch, Xbox One and PS4. Another really promising game with a fairly unique premise is Black Future '88 which is a roguelike game with many tweaks to the formula. The scenario has your character with a doomsday device installed in his system with only 18 minutes to live and he needs to get to the top of a living tower. The tower is constantly evolving and you can slow the march of time with items and actions, but the clock is always ticking. 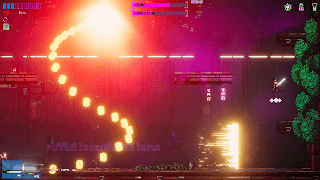 As the tower is explored new enemies are spawned, weapons of all types are dropped and it is your mission to get to the top and kill the tower. The game features a KILLER synth-punk soundtrack and really cool pixelated cyberpunk look. 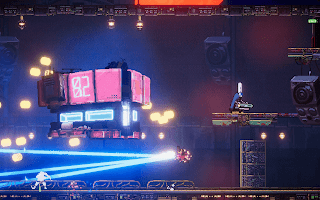 The theme of the game is very 80's as the title suggests, with the world stuck in the look and feel of 1988 since the world was hit with war and destruction. I did not get very far up the tower in my multiple attempts at playing the game, but like any good rogue-like that did not discourage me. The procedurally generated levels and changing enemies/weapons kept me interested as did the secrets and perks/curse I found that help and hinder progress. Choices are given when finding new abilities and that makes a big difference on how you progress. 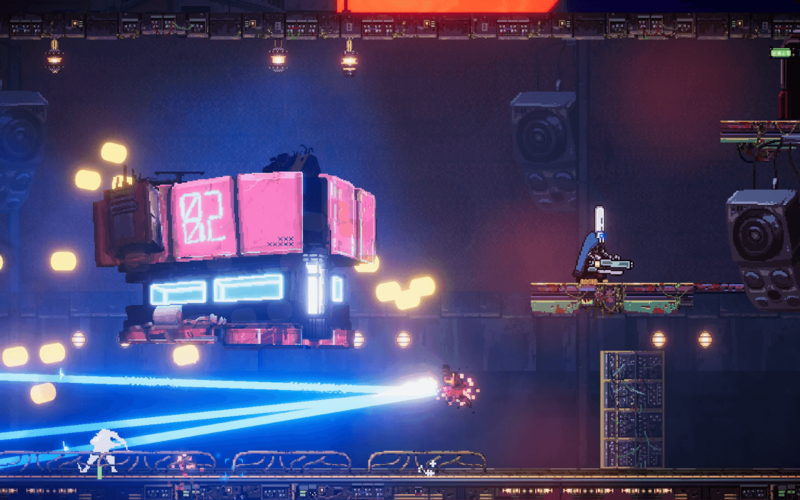 At its heart it is a twin stick shooter but offers a lot more once you dig into the systems. It was a great looking title, with fast action and terrific controls. 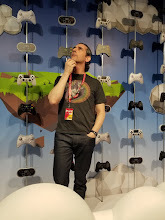 The world was very interesting to explore and I enjoyed meeting most of the team at PAX East. The developer is distributed with the small team scattered across the globe contributing new aspects of the game as needed. It is a system that they seem to enjoy and works extremely well for them judging by the content I saw. Well worth checking out once it releases later this year on PC.